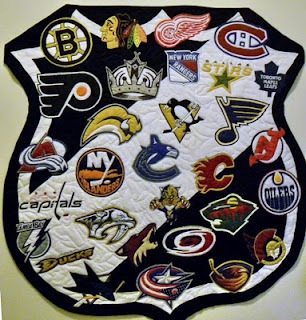 ScrappyBlue Quilts: It's a Hockey Christmas!! Well here you go ... for anyone who has been following the progress of the making of the NHL quilt, here's the final result. I used the actual black and white NHL logo for the background design and have arranged the rest in order that they joined the league, with the Original Six at the top. I was quite amused that my Canucks ended up smack-dab in the middle! People will probably think I made it that way on purpose but it's honestly just the way it worked out. I outline quilted each logo to make them stand out, and in the background there are orcas outlined in between them all. The final result is about 50" wide, 56" high and hangs on the wall in the office. About a week ago, I w on (again) on a call-in radio contest! They had told me at the time that I won a signed picture of Ryan Kesler and a $25 gift card. No details, just that and where to pick them up. The other day I went out to the mall to get my prizes and I was blown away by what I actually won. 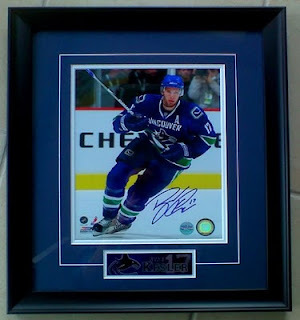 The Kesler picture is an 8x10" picture in a lovely mat/frame with a certificate of authenticity on the back, valued at $150! I don't get out to that mall very often so I used my gift card while I was there. They happened to be having a "buy one thing, get anything else at 50% off" sale so I got a long sleeved (kid's size XL) t-shirt regularly priced $35 for $20, and a $9 shot glass f or half price ... total value of my prize: $194.00!! 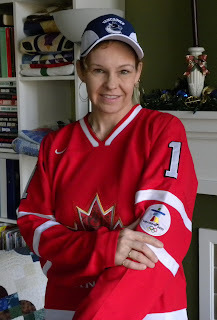 For my main Christmas gift this year, I was pleased to receive a Team Canada Olympic Jersey with Luongo #1 on it. I figure I'll get him to sign it next fall at training camp when I go to take more pictures. Now that I have my Kes picture in my Canucks collection I'm thinking I should get some of the other pictures I have of the guys printed off and have them sign them at training camp too. Then I can frame them myself and hang them in the hallway here ... my very own "Coach's Corner"! !